So all the nomads had gathered to the fray. We finally headed out of Broken Hill after a hot shower and grocery shop by around 11.30 (one day we’ll get this quick pack up thing right) and had a nice easy drive out to Peterborough. Stopping for some photos, fuel, lunch and the quarantine check-point (apparently it’s fruit AND vegetables so I had to give up a couple of veggies though I was allowed to keep the bag of potatoes I’d just bought). We arrived around 3.30 and were set up by 4 (hard to believe but we stop quicker than we start in this family!). I called and booked us into the Sound and Light show at the local Steam town attraction and enjoyed a free taxi-ride there for the show. By the time the show finished and we waited for the taxi home, I reckon nearly all the other guests knew of my dance with Jack the Cocky – Miss6 was off spinning a yarn to the nomads of our adventures so far and made a great story out of Jack and the nasty gash on my little finger. By the time we left there I had advice to visit the local hospital first thing as it would be the easiest way to get a Dr to check it out. Waiting at the hospital the next day all I could hear was the chatter at the nurses station ‘yes a cockatoo’, ‘the cocky bit her finger’, ‘I’ll gave to check with the Dr about a cockatoo bite’ – finally a very handsome young Dr Tom strolled through the door to take a look at the now infamous cocky bite (it’s moments like these you miss the manicured acrylic nails). A quick clean, redress (of the wound – this is a G rated trip!) and a tetanus shot later and we were on our way. 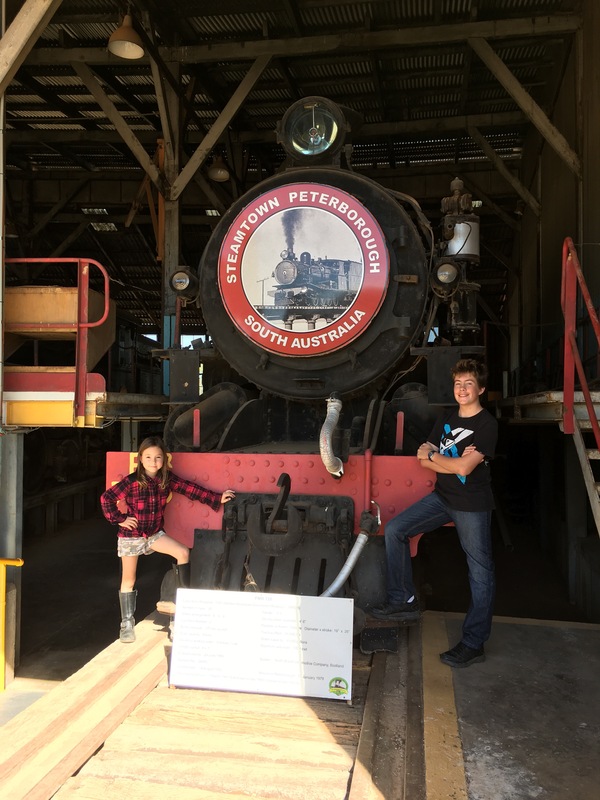 We’d booked for the evening sound and light show plus the guided tour the following day so we headed back to Steam town. We joined the tour and Miss6 was again in her element with doting nanna’s and a lady who’d brought her two dogs on the tour. It wasn’t long before I could hear the whispering again through the crowd ‘yes it was a cocky’, ‘a cockatoo bit her right on her finger’, ‘it was a nasty bite from what I’m told’ – eventually one of the lovely older ladies asked me if it was me that had been bitten and how was my finger. When we returned to the caravan park I overheard two ladies talking about the cockatoo bite in the toilets – when I came out they asked me how my finger was and if I’d gone to the hospital to see the doctor. I’m considering renaming my blog now to the Cockatoo Kid! Just remember it could always be worse 🙂 And at least you guys had your gastro bug before you started. We got ours from Renner Springs all the way to Darwin, 4 out of 4 of us got sick but we all took turns not all at once. Tents, sleeping bags and exploding children do not mix, lol. Sounds like your still having an awesome time so far and I can’t wait to read more posts as I plan my travels. Sounds like a fantastic adventure with plenty of memorable moments, good & bad:) Can’t wait until we set off in 3 weeks.